Nifty Auto opened 1.03 per cent higher on Monday, backed by robust sales figures for June 2018 posted by the automobile companies. Stocks of Mahindra & Mahindra, Tata Motors, Maruti Suzuki and Eicher motors also opened on a higher note at 1.30 per cent, 2.49 per cent, 0.72 per cent and 1.54 per cent, respectively. 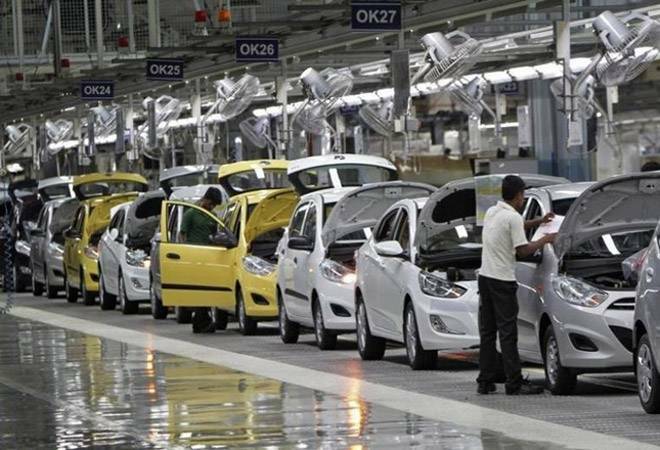 The increased sales figures posted by the Indian auto companies depict a cheerful picture. But, the main reason behind the higher sales this June was weaker demand in June 2017 due to two main factors. Firstly, the Supreme Court had mandated adoption of BS IV to improve environmental conditions. The BS IV was applicable from April 1, 2017, following which the auto industry had to revamp their manufacturing line-up to incorporate such changes. The second factor that hit sales last year was the uncertainty over the GST rollout. The car makers willingly controlled supply to dealers to minimise losses arising out of transition to Goods and Service Tax regime. The drop in demand and supply of automobiles in June 2017 led to low base effect. But, the growth in economy has also helped the figures shine this year, according to automakers. Maruti Suzuki posted 36.30 per cent rise in sales for June 2018 as compared to June last year. Total 1,44,981 units were sold as compared to 1,06,394 units in June last year. Increased sales were backed by higher demand of compact cars such as Swift, Celerio, Ignis, Baleno, Dzire and Tour S, which in totality grew by 76.7 per cent. Maruti's total domestic sales grew by 45.5 per cent to 1,35,662 units and its total exports fell by 29 per cent to 9,319 units as compared to13,131 units exported in June 2017. Maruti's light commercial vehicle offerings and super carry saw a steep rise in sales, selling 689.3 per cent more units as compared to June 2017. Mahindra & Mahindra's sales grew by 26 per cent in June. M&M posted 23 per cent rise in domestic sales, selling 41,689 units in June 2018 as compared to 33,904 units in June 2017. M&M's exports grew by 87 per cent, selling 3,466 units as compare to 1,855 units in June last year. The Passenger Vehicles segment (which includes UVs, cars and vans) sold 18,137 vehicles in June 2018, as against 16,212 vehicles in June 2017, a growth of 12 per cent. In the medium and heavy commercial vehicles segment, M&M sold 1,108 vehicles in June, a growth of 58 per cent. Tata Motor's total sales rose 63 per cent in June. Tata Motors registered a 50 per cent growth in the commercial vehicle selling 38,560 units in June 2018 as compared to 25,660 units in June 2017. In Q1FY19 (April-June 2018) cumulative sales growth in the commercial vehicle stood at an impressive 71 per cent. The medium and heavy commercial (MHCV) truck segment registered another strong performance with 11,524 units, a growth of 50 per cent over June 2017. Demand for the MHCV trucks continued to be boosted by the government's focus on infrastructure development, road construction, building of irrigation facilities and affordable housing projects across the country. The light commercial vehicle (LCV) truck segment reported a significant performance with 4,485 units, a growth of 69 per cent, over June 2017. This growth has been led by the e-commerce, increased rural consumption and supported by the launch of new products. The company's sale from exports (from CV and PV) in June 2018 was at an impressive 5,246 units compared to 3,504 units last year, a growth of 50 per cent. Royal Enfield's total sales rose by 18 per cent. Sales were backed by models having engine capacity more than 350cc, which rose 29 per cent to 5,708 units, while the sale of those below 350cc rose 17 per cent to 68,769 units as compared to June 2017. Exports rose 27 per cent to 1,889 units, as compared to June 2017 exports of 1,489 units. Bajaj Auto posted 65 per cent rise in sales of motorcycles and commercial vehicle segment. Bajaj sold 4,04,429 units in June 2018 as compared to 2,44,878 units in June 17. Motorcycle sales rose 65 per cent selling 3,37,752 units last month. Bajaj's exports rose 44 per cent as compared to June 17. Commercial vehicles rose 66 per cent year-on-year to 66,677 units, registering Bajaj's highest ever monthly sales. Escorts Ltd Agri machinery Segment (EAM) recorded 72.8 per cent rise in tractor sales, selling 9,983 units in June 2018 as compared to sales of 5,776 in June 17. Domestic tractor sales rose 72.1 per cent to 9,758 units as compared to sales of 5,669 units in June 2017. Exports rose 110.3 percent to 225 units as compared to exports of 107 units in June 2017. Ashok Leyland recorded 28 per cent rise in sales selling 15,791 units last month as compared to 12,333 units in June 2017. Sales of medium and heavy commercial vehicles rose 22 per cent to 11,257 units as compared to 9,205 units in June 2017. Sales of light commercial vehicles rose 45 percent to 4,534 units as compared to sale of 12,333 units in June 2017.